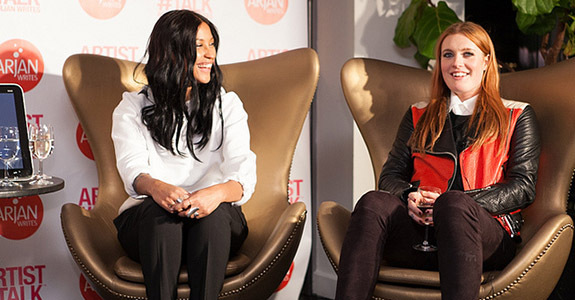 Ellie Goulding ARTIST#TALK with Arjan Writes! The Lower East Side doesn’t look like it used to. There’s restaurant after restaurant that serve dinners that cost more than $20 a plate. You forget that a punk scene even existed here, with all of these young professionals walking around in their button downs and dark blue denim jeans. Attempting to avoid the Friday night shuffle, I turn the corner on to Rivington and walk towards a swanky hotel I have never heard of before. The Hotel on Rivington has a small entrance and lobby, you almost don’t realize how high the building is. Someone pushes the number 20 in the elevator and we rise to the top floor where the penthouse suite is. “Elevator music” is playing but it’s not smooth jazz or easy listening. It’s non-distinct electronic beats that seem a bit erratic. The music seems to be style over substance. It’s something to hear, while standing in awkward silence in close proximity to strangers. The music is emotionless and repetitive. The elevator door opens to fans and friends of Ellie Goulding mingling about. We step into the penthouse and it’s freezing. We make our way to the bar for some champagne, while scoping out the gorgeous room. Bloggers, photographers, writers and industry types are all rubbing elbows. Arjan Timmermans (of ArjanWrites.com fame) is being a wonderful host by greeting everyone and introducing himself. It amazes me how much he remembers about people he’s already met. He references particular blog posts they have written or their dog they have at home. It’s a gift to be able to retain all of that information. Hors d’oeuvres are being served on trays by waiters. There are people wearing Beats by Dre headphones (which are coming out in new colors!) that are attached to glossy HP laptops, that are running the latest version of Microsoft Windows. I need to use the restroom and I ask the bartender where I might find one. He directs me upstairs. As I’m walking towards the restroom a woman intercepts me. She tells me Ellie is in the restroom! Phew. That would have been awkward if I walked in on Ellie brushing her pink hair, or you know, using the toilet. I blame the bartender for my mistake and I rush back downstairs to find the other restroom which is tucked in a corner obstructed by wires, light stands and tech people. Arjans who has been doing this ARTIST #TALK series for a year now, is hosting the event with HP here at the Rivington Hotel. It’s part interview, part talk show and part listening party. Tonight Arjan is having a conversation with Ellie Goulding. You know the folk-electronic singer-songwriter from the UK whose song “Lights” recently hit #1 on the Billboard charts. The song that has taken over American pop radio, playing a few times an hour on all of the stations. It’s a strange phenomenon because “Lights” was released over two years ago and probably written over three years ago. Arjan brings up this fact during the interview and even Ellie can’t explain the success of “Lights.” She explains it is extraordinary; she also feels very detached from the song itself because it was written so long ago. The emotions attached to it, are unfamiliar and distant. Ellie also mentions that her friends in America joke to her that they are sick of hearing the song on the radio. I disagree. “Lights” is one of those rare pop songs that never overstay their welcome (i.e Gaga’s “Poker Face” or Katy Perry’s “Teenage Dream”). It’s infectious electro-pop bursting with just enough emotion and “hope” to dance to at a club or in your car. Speaking of hope, Arjan pointed out that many of Ellie’s songs on both her albums are deeply sad, emotional and full of loneliness. But there seems to always be a silver lining hidden within the verses. Arjan calls it hope, or “light” at the end of the tunnel of all this darkness she is evoking. For the most part she agrees with him. She agrees that her songs are often melancholic. She finds inspiration in that sadness, in that loneliness. It is the reason she has a difficult time recording in huge studios, surrounded by producers. So, instead of confining herself to studios built in large cities she decided to visit Dingle, Ireland, a small waterfront town that sits on the Atlantic coast. According to Ellie, there is a legend of Dingle, where musicians and artists go to seek inspiration and solitude. So, she met producer Jim Eliot (one half of electro-pop group Kish Mauve who produced Kylie Mingoue’s “All the Lovers”) there and wrote most of her new record Halcyon. In Dingle, they created “sounds” like little kids, according to Ellie. I imagined them banging sticks on rocks and distorting vocals on synthesizers. The first sound they created was the first sound you hear off the single “Anything Can Happen.” That high-pitched bird-like noise. That sound is the origin of the record. From that moment on every thing seemed to click. Her writer’s block receded into the nearby ocean and “Anything Could Happen” was the first song she completed. To further Arjan’s thesis on loneliness found in Ellie’s record Halcyon he plays some snippets of new tracks and then recites lyrics for the audience. She seems very excited to let everyone hear the new songs but she seems very nervous about having her lyrics read out loud in front of her. One track in particular stands out most, lyrically and musically. It’s called “My Blood” and Ellie seems to almost tear up as the song ends and Arjan recites some of the lyrics back to her. “I’m thrown in the gunfire of empty bullets,” she sings on the track. It’s sounds big and full. It has this ghostly gospel choir sound to it, but with dark imagery. Arjan calls it the “most depressing song” on the album and Ellie seems to agree with him. She explains that the song is about “someone who depletes you and never gives anything back.” She also informed us that it was the second song she wrote for the album. Arjan points out other themes within her new album. Water is one of them. Writing an album on the Atlantic coast will inspire all kinds of references to water. She mentions the fluidity and constant movement of water as an inspiration. She also jokes about wanting to be a mermaid and is intrigued by the idea of being lost at sea. In her “bloody” music video for “Anything Could Happen” there’s lots of water. But this time it’s the Pacific coast she is walking around and soaring above, which leads me to the last metaphor Arjan discusses, birds. The album title is Halcyon which is full of references to birds. There are many types of halcyons. According to Greek mythology there is an “ancient belief that the bird nested on the sea, which it calmed in order to lay its eggs on a floating nest.”* This supposedly resulted in two weeks of calm weather. So, the halcyon signifies peace and serenity. Then there’s the Plato reference where Socrates explains the myth of the Halcyon, where a woman transforms into a bird searching endlessly for her husband. Is Ellie a halcyon (or the Halcyon) in the video for “Anything Could Happen?” Is that her with “wings” soaring above the Pacific Ocean? Let’s not forget those bird noises which lay the framework for the entire song, if not the entire record. One other reference to halcyon which was not mentioned during the interview is that of the drug halcion which is prescribed as a sedative for severe insomnia. It is also used recreationally to achieve an euphoric high. If halcyons signify peace and tranquility for the Greeks, perhaps halcyon does the same for Ellie. Is Ellie alluding to it? Everyone knows what happens at those electronic music festivals. The interview concludes and Ellie hugs Arjan and walks upstairs. We are all wondering if she’ll come back down to hang with us and before we know it she’s back. She poses for pictures and smiles for cameras. Each of us get a turn with the electro-pop songstress. I find myself next to her and I introduce myself and tell her I write for PopBytes. “I just did a video for you guys,” she responds. At the time I had no idea what she was talking about. But I thanked her anyway and told her that I love her covers of Midlake’s “Roscoe” and The Weeknd’s “High for This.” She thanks me again and I tell her that I’m really bummed that her show at Santos Party House (October 11) sold-out in three minutes and I couldn’t score a ticket. I forget that a friend was even taking our picture, I was so enthralled with talking to her, that I look distracted in the photo. After a few minutes Ellie ascends back upstairs and we all gush about our photos and the event itself. I have another glass of champagne and we end up on the rooftop of the hotel. Ellie is sitting down at a table in the corner surrounded by a few people. We walk to the other side and take in the view of Manhattan. It’s a perfect night. We converse with employees of HP and Arjan himself and mingle through the crowd. We decide to leave and walk over to the elevators. A few of us pick up a CD single of “Anything Could Happen” and descend down the twenty stories. We part ways and the Lower East Side is even more crowded than before. All I hear are those bird-like noises of “Anything Could Happen” echoing in my head as I navigate through the crowds on the street, thinking to myself, anything really could happen at any given moment. Like Ellie said just moments before, all you need is hope “in the least cheesy way possible” to get through those dark times. * I don’t have a degree in Greek mythology so this quote was borrowed from Wikipedia. Video: No Doubt's "Push and Shove"